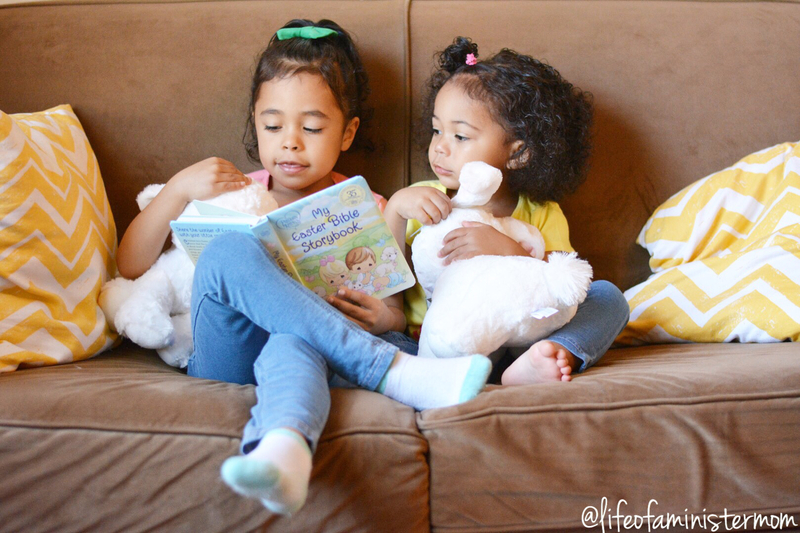 A Precious Moments Easter + Giveaway! Easter is mere days away, and it seems everyone is in preparation mode. In this household there will be gift baskets, egg decorating, a special dinner menu, and we’ll be attending the (extra packed) church service this weekend. 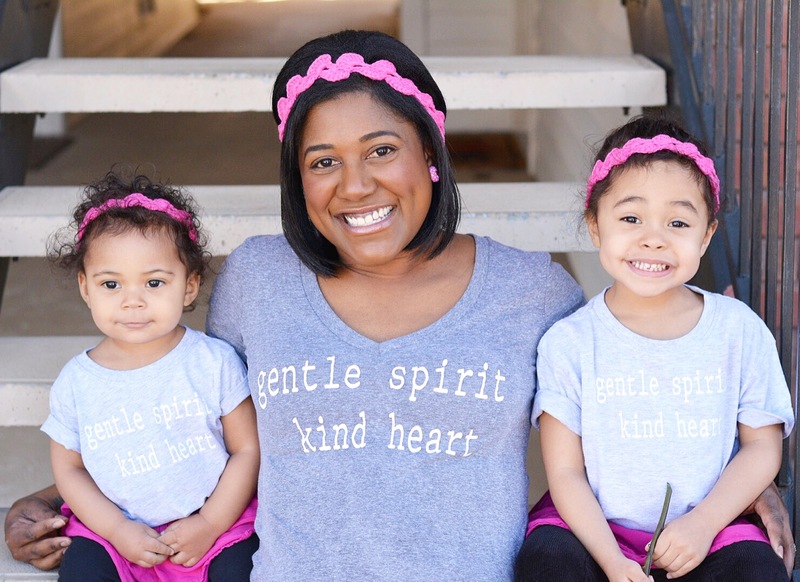 All things I look forward to, but I’ve also been in search of ways to better emphasize the importance of this holiday to my girls. Don’t get me wrong, bunnies and treats and egg hunts are fun, but as a celebration of the day Jesus rose from the dead, Easter means so much more. It symbolizes forgiveness, rebirth, and God’s saving power!! 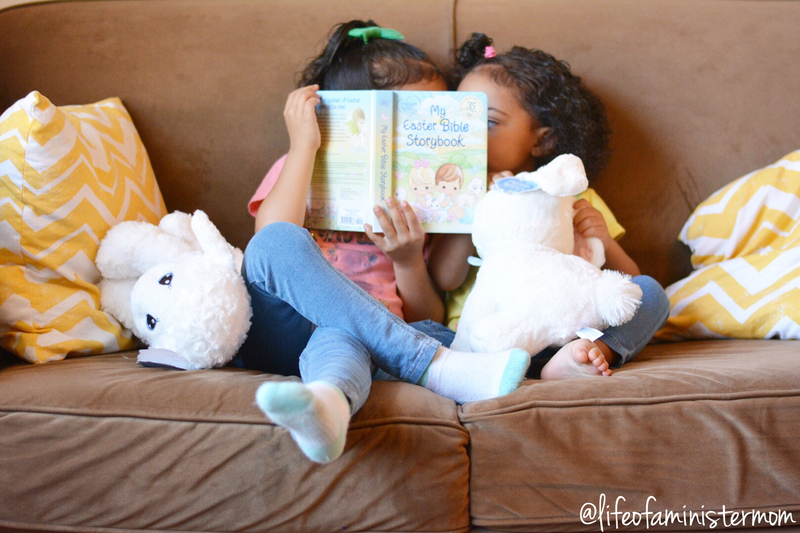 It’s a time to contemplate, mourn and rejoice, and this year my girls and I have been reading My Easter Bible Storybook by Precious Moments to help illustrate what this day is truly all about. Our family has been fans of Precious Moments for a while now. Not only are their trademark, big-eyed characters adorable, but their musical options and Book of Prayer have long been staples at bed-time. 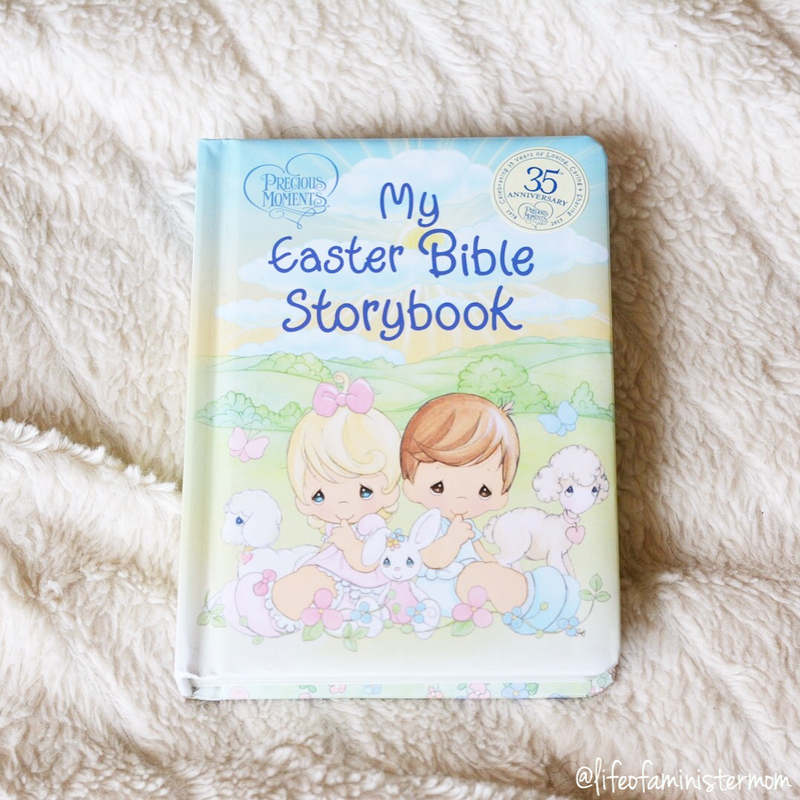 My Easter Bible Storybook has been a great addition because it shares biblical truths in a simplified and clear manner, without dumbing it down. 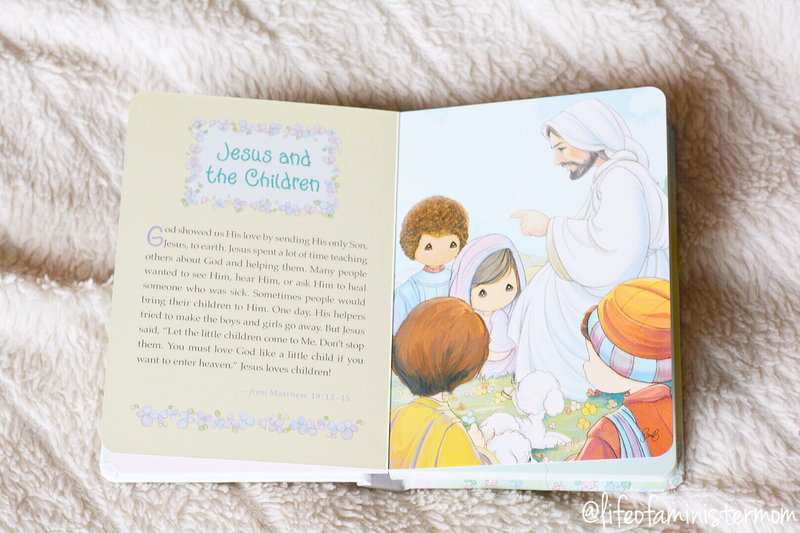 The colorful illustrations are eye-catching and hold the attention for both my 2 and 5 year old, and my eldest likes memorizing the prayers, songs, and verses we read each night. 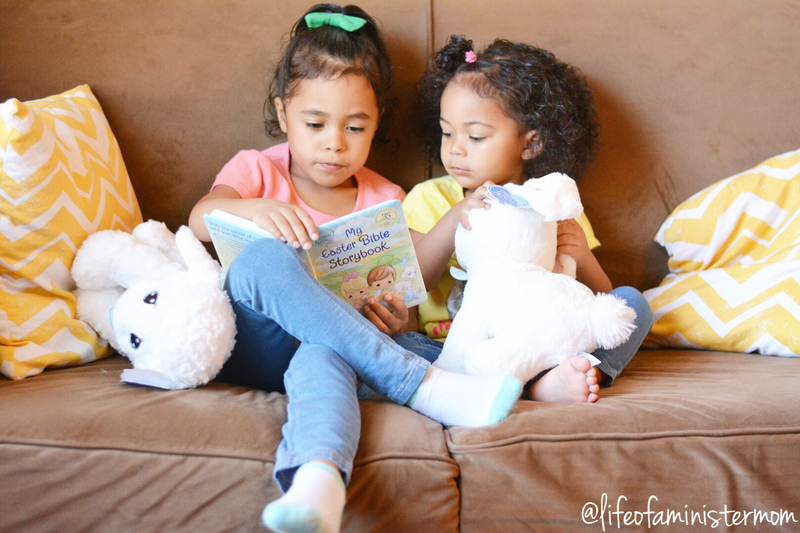 They also enjoy reading to each other, and having an audience of some cuddly friends too! 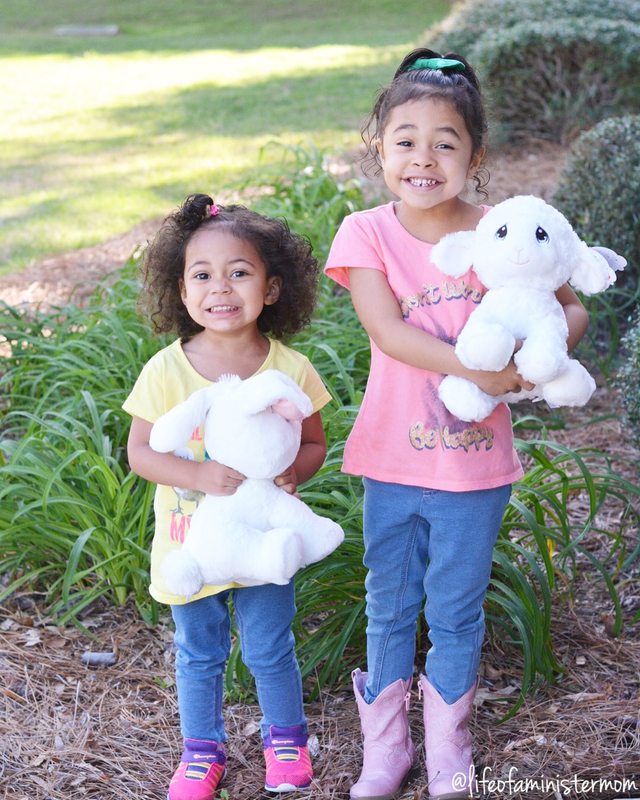 These sweet additions are plush and so soft, and even though they already played with them briefly, you better believe they’re going back in their baskets for Sunday! Ha! 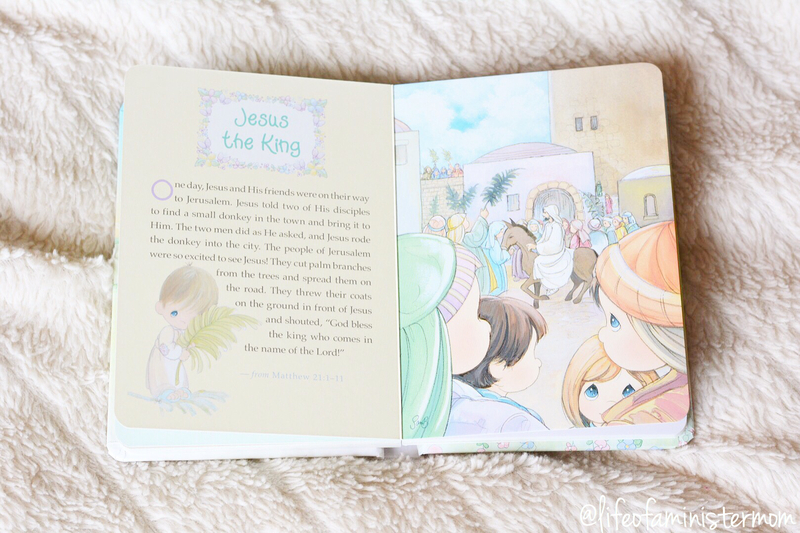 Precious Moments has a great selection of keepsakes and special mementos for every occasion, and I’m glad we decided to add My Easter Bible Storybook to our growing collection. It’s so important to show our children the love that Jesus has for us and the sacrifice and resurrection that made ALL the difference! 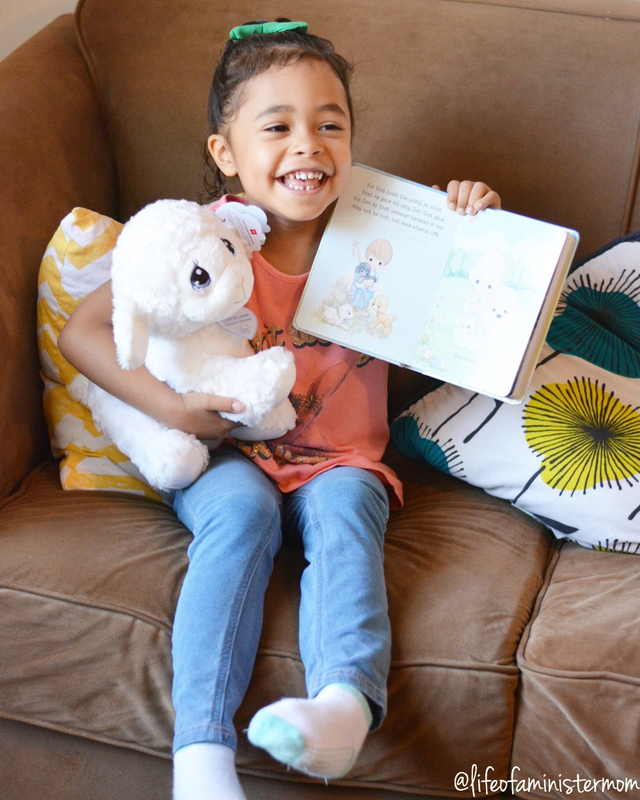 We’ll be reading this book and playing with our new stuffed friends year round, not just during this season, and I hope we always remember to reflect on the grace, mercy and love of our Savior! How do you celebrate Easter? I’d like to commemorate this special time with a giveaway for you!! 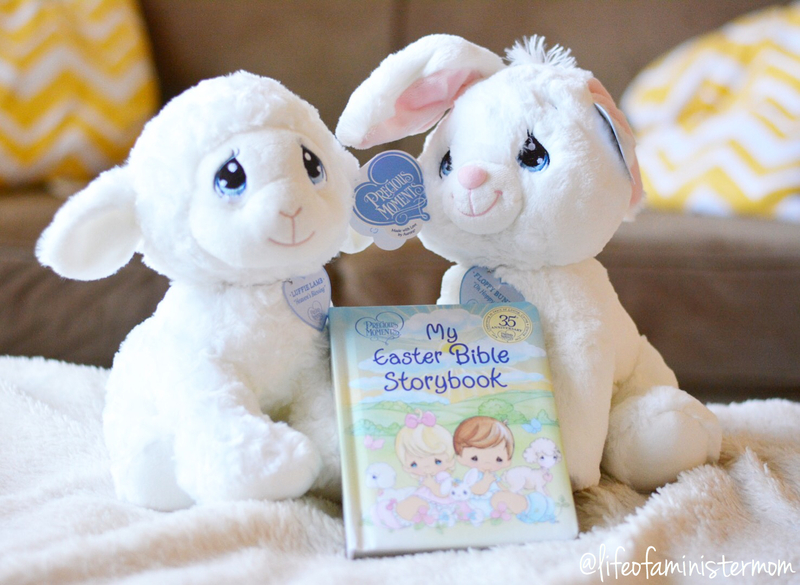 Enter below for your chance to win your own copy of My Easter Bible Storybook and your very own Luffie Lamb and Floppy Bunny too!!! There are also a plethora of savings on the Precious Moments website. You can check them out here! Happy a blessed and happy Resurrection Day!! They are too sweet! That book is so special! I grew up with precious moments!! I’d love to pass those memories down to my girls as well. I have such fond memories of the books and he figurines. I was introduced to them by my grandmother who passed away of breast cancer so it’s extra special. That’s really, really special Jamie!!! Thanks for sharing that sweet memory and have a happy Easter! So sweet!!! Have a great Easter! what a great giveaway! we always celebrate by being with family! this year we are hosting at our house! How fun!!! You’re an awesome host! Blessings to you Chanel!! Time reflecting on jesus and spending time with family is how we celebrate. LOVE this! That’s the best way to celebrate!!! We go to Easter Service as a family, we take our kids out of childcare for the praise music at the end. And then we go to brunch with extended family. We celebrate basically all month long over here…we have a huge family. That sounds wonderful!! It’s such a special time to celebrate!!! I loved Precious Moments when I was a kid! Awesome giveaway. We are staying home on Easter and having friends and family over for lunch and a big Easter egg hunt! Precious Moments is so cute! I hope you have a great day!! We love precious moments! This is such a cute giveaway! Thanks!! We love them too!! When I was about 8 or 9, I would ride my bike to the local Hallmark store and I would just look at all the Precious Moments. I didn’t have any, but I loved looking at them! The Bible is perfect for little ones. I loved admiring them at the Hallmark Store too!! What a sweet memory!! I’m sure they would Erika!! Thanks for entering!!! So cute! I had one of these when I was growing up (a different version but still Precious Moments) and it was my favorite! They are so sweet! We LOVE Precious Moments! Thanks Erin! We do too!! Adorable giveaway! I was always a huge fan of Precious Moments growing up and now we have one of their bibles for my two year old, but it is a little too mature for her right now. 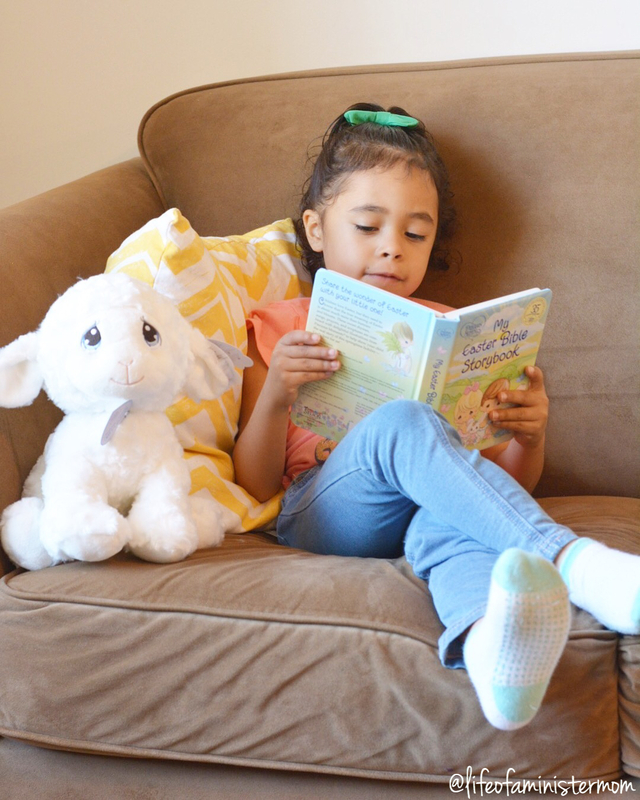 This Easter story would be perfect to start introducing her to the Easter story and helping our 4 year old dive in deeper. Thanks Brittany!! And, yes! I love that this book keeps the attention of both girls, even my 2 yo!! Excited to celebrate the resurrection of our Savior on Sunday! 8:30 service at church, and then we’ll head to my parents’ for a delicious lunch!! Sounds like a wonderful plan to me!! i hope you have a wonderful Easter!!! Precious Moments books were my favorite as a child! What a great book and the bunnies are adorable! This is Easter we are having dinner with Josh’s family! That sounds fun!! Enjoy your weekend Kristen! We go to church. We have our family over and have an Easter Egg hunt and dinner. That sounds like a wonderful way to celebrate! That book looks like the absolute SWEETEST. I grew up on Precious Moments and we absolutely LOVE them ! We celebrate with an Easter Egg Hunt at home. Easter egg hunts are always fun! Happy and blessed Easter to you too!!! We celebrate Easter by having a family meal together and praising the Lord. These photos are so sweet! I would love to add this book to their collection! My oldest is starting to learn about Jesus and prayer and LOVES books, I will definitely have to get it! Thank you! Happy Easter! You’re so welcome Maggie!! Have a blessed and happy Easter!!! We get t together with family,first church then dinner! We celebrate with a family lunch. We start with hiding and finding Easter eggs, and then we have a nice family dinner! That sounds like a wonderful time! We all go to Easter Mass and then I like to go to visit my moms grave and take her flowers. She used to just love Easter Sunday! How wonderful!! I hope you had a great time!!! My mom LOVES Precious Moments everything so we had a lot of in my home growing up. For Easter, we also try to remind our kids that it’s not about the bunnies and the egg hunts and the candy, but the sacrifice of our Savior. We’re trying to teach them that the things they see at Easter are symbols of something bigger and more important. I hope you had a sweet time!! !